Happy Thursday ladies! I was suppose to have the day off today, but I forgot and ended up scheduling a business dinner tonight. Oy. Don't you hate when that happens? In other news, I finally got through the last season of Game Of Thrones, and now I can't wait until the next season starts again. I love the development of the characters throughout the storyline! Have you seen the last season, and did you have any thoughts about it? Today I have Wet 'n' Wild Megalast's newest summer collection called All Access, based after summer music festivals. Most of this collection are crellies along with one shimmer. This limited edition collection features white tops and can be found at drugstores in their own display for a whopping $1.99 each. The formula on these leaned mostly on the sheer side and took at least three coats each, but keep in mind that they're mostly crellies which dries to a squishy finish. My major gripe with this collection, or with Megalasts in general is that the brush is too wide for my taste, making it difficult to maneuver without messing up the cuticles. But, for considering how wonderfully priced these are, I'm willing to forgive that! My first polish is a nice bubblegum pink crelly called Beat Of A Generation that needed three coats for opacity. The formula was easy to apply with minimal streaks. A favorite of mine is this lovely lavender purple crelly called Trippin' On The Boardwalk. Here, I used three coats for opacity. It still had some VNL and probably could have used four coats. Next is another surprise favorite for me, and that's Contact High, a gorgeous neon green jelly that used three coats for opacity. Behold this beauty! It's not often you see a shade of green with a jelly formula! 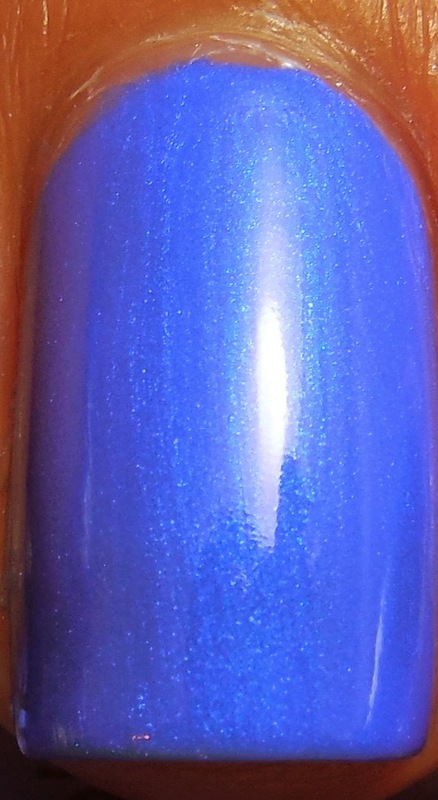 The shimmer in this collection is a Smurf blue shade with a slight silver shimmer. Isn't she pretty? The silver shimmer isn't terribly strong, but it's not hidden either. It's just right! Next I have a sunflower yellow crelly called A Venice Day. This one did not have the easiest formula to work with, and still showed some streaks even after three coats. Not surprising for a yellow I suppose, but the color is nice! Lastly I have a peachy coral crelly that applied smoothly with no streaks, and that's Love Me Some Muscle. I don't think I have any shade quite like this, and I'm very pleased with the way it looks on me! Overall, I really like the shades in this collection and I think the crelly formulas make them worthwhile to check out. They're not solid cremes or sheers, but a nice balance in between that make them unique in any collection. Hopefully you'll spot them next time you're at the drugstore and pick some up. My next project will be attempting some more nail art with these! Have you any favorite crellies?